Figure from The Environmental Investigation Agency, a U.K. Based Study Group. From Billy Arjan Singh World Renowned Indian Tiger Expert. The only man to successfully reintroduce a captive bred tiger to the wild. Annual turnover estimated by Interpol. The illegal wildlife trade is now widely recognized as the world’s second largest racket (after drugs)! Should we be so concerned with subspecies? “As the time approaches for final extinction, for me as an individual, and for the tiger as a race, I feel that I should share my thoughts with my countrymen, many of whom do care, for the demoralizing extinction of processes of evolution of animate creatures, by the rapacity of the human race. We have ravaged the habitat of underground dwellers by the plunder of fossil fuels built up over the millennia and by strip mining. We have razed great timber stands, and unleashed floods and siltation for short-term political motives. We continue to rob the oceans of their sustainable wealth in international bickerings. We have upset the rhythm of life by the unrestricted proliferation of the human race and savage experimentation with other life forms to preserve our own species…. Can we let this happen to such a majestic creature whose ancestors first began to roam the earth over 2 million years ago? A genetically managed, self sustaining, secure preserve dedicated to saving the tiger as a species via the breeding of healthy generic tigers. Its mission is to maintain and protect these animals in vast natural habitats until a time when they are not considered prey by humans for their medicinal attributes or glamorous skins – a time when the reintroduction of these tigers into their natural wild territories is accepted by a more realistic scientific community. 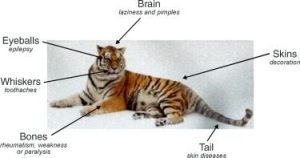 Dr. Michael Bleyman said, “Look at CPT (Carnivore Preservation Trust). It is a prototype for a much larger facility.” The rendition at right is an early concept. 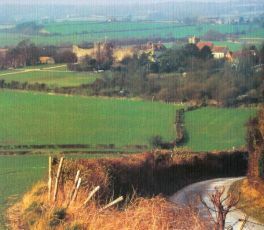 We are now planning a village based on old English architecture. Wild Tiger Population: 2,000? Possibly 1,500? These are estimates from sources other than researchers, scientists, and government agencies. Many of these people and organizations produce figures that reflect some success in their efforts to save the tiger in the wild. It is estimated that these figures are exaggerated by 100% – 200%. Richard Ives traveled throughout many regions having wild tigers. During his search he spoke with ex-hunters and local preserve wardens. 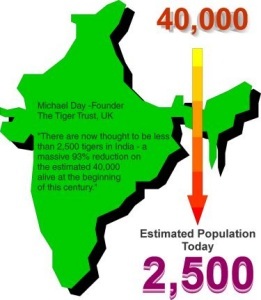 One hunter who lived and hunted in India most of his life estimates there are between 500 and 700 tigers remaining. Based on local reports there may be 100 tigers remaining in Thailand. Their government estimates 400 – 600. Using sophisticated unmanned cameras an Australian team led by Tony Lynam, a zoologist from Perth, Australia, tracked tigers in Southeast Asia. Out of four major Thai parks he got forty tiger pictures, but these represented only six individuals. In one Thai reserve of 80 square miles, Lynam’s team found a single tiger. Field scientists have long over estimated the remaining number of tigers in the wild. There is now conclusive evidence even fewer wild tigers remain. Most predicted total extinction by 2025. This paper was written in 1998 by Jason Savage, director of the Zoe Foundation. Now it’s 2003. 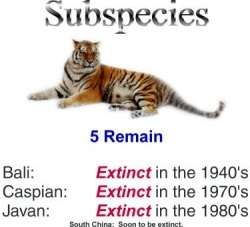 Not much has changed since that time except the illicit animal trade has increased and the South China tiger has been declared extinct in the wild by Ron Tilson (November 2002).